Following the first two photos from the meta adaptation of R.L. 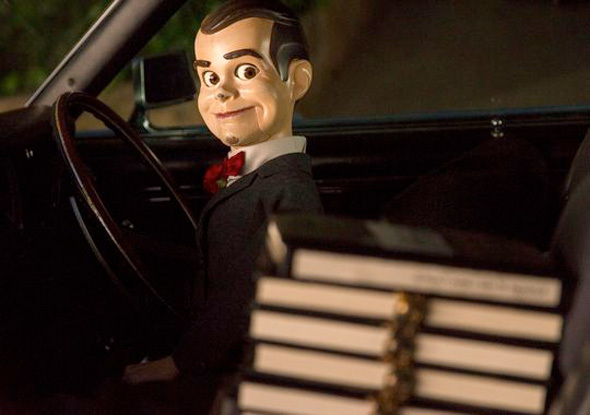 Stine's young adult horror novel series Goosebumps, we have three more photos showing off Jack Black as the beloved author. But in this story, he's a bit of a weirdo, because we learn that Stine is actually a keeper of monsters and a prisoner of his own imagination. Stine keeps the monsters in his book so they don't get unleashed, but of course, that's exactly what happens when a new kid in town (Dylan Minnette) unintentionally lets them loose. There's some recognizable monsters from the books in these photos, but we're not sure how this is going to turn out, because it looks pretty goofy, almost like a horror version of Night at the Museum. But maybe it'll be good? This is sounding great. Can't wait for a trailer.